We're very pleased to announce the long awaited release of Learn to Play The Beatles To A Tee! Volume 3 Instructional guitar DVD. 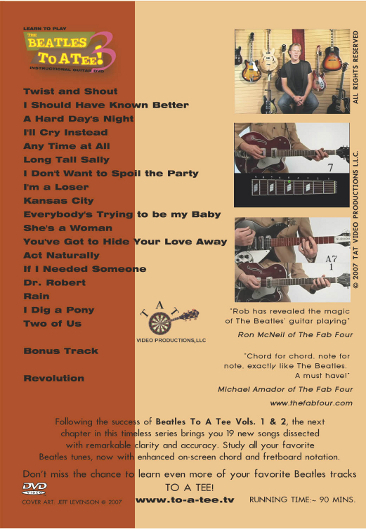 We've worked hard to continue to bring you the most accurate Beatles guitar instruction available. This latest DVD features all the things you've come to expect from To A Tee plus more. This DVD features 19 songs! That's the largest selection to be presented on a single DVD in this series! Riffs and lead segments have been slowed 50% and for the first time in this catalog, feature an on-screen fretboard with colored markers indicating exact finger placement as the slow segments play! See all those classic Beatles guitars in action as Rob Taylor breaks down some of the most puzzling mysteries of Beatles guitar parts. Features on-screen fret board with colored markers indicating exact finger placement.